If you are into woodworking field, then you must be aware of the plunging tools. One such tool is a wood router that helps you to rout the hard piece of wooden or plastic materials. In this beginner’s guide, we are going to tell you How to use a Wood Router for your wooden project. A wood router is a versatile tool that is suitable for a wide range of wooden projects. You can use this wood router for making the complex and basic edges on the wooden parts. You can connect the wood router to many bits for applying a number of profiles on the edge of the substance. If you are a beginner in the woodworking field and don’t have any experience about how to use this tool. Then you are at the right place, as here we will discuss in detail the procedure of using the wood router. How to use a Wood Router? With the help of the wood router, you can do several types of routing in no time. It provides you with various features that take your woodworking experience to a whole new level. You will come across many different types of wood routers that are available in the market. If you just want to start using the wood router, then you have to first decide its exact usage. Whether you are going to use it for the plunge based router or fix based router. The difference between these two is that you have to set the specific depth for cutting while you can set your desired depth in plunge based routers. After that you are clear with the types of routers and its use, you have to select which is suitable for you. Make a choice from the plunge base router or fix base router. Now you can follow the below steps to start using your first wood router. There is a collet in every wood router that enables you to use the different bits for various jobs. You will find a wide range of bits for your project. Cove Bit: – If you want to make a rounded profile on the edge of the wood, then you can use this bit. Roundover Bit: – With the help of this bit, you can cut the round profile into the square one. Straight Cutting Bit: – As the name implies, this bit will help you to make the straight or square channel into the middle of the wooden piece. After selecting the right bit for your wood router, you can start with routing an edge. While routing the edges, you must use the best wood router wisely as it can cause severe injury. With the help of a wood router, you can easily make smooth edges on the wooden surfaces. These bits are to be made with the help of the bits you have chosen. The router will move in the clockwise direction when in a downward position. And in an anti-clockwise direction when working in an upward direction. While routing if the router is hard to control then you are using it in a wrong direction. And if the router is overheating, then the motor is overloading. Then adjust the speed of the router. You must use the wood router at a constant speed for fast routing. This way you will also learn how the router works and behaves. It is mandatory to use the safety glasses while working with your wood router. This is because the system throws wooden chips that can damage your eyes or other body parts. Also, unplug the tool from the power source when you make any type of adjustments or changes. Now that you know How to use a Wood Router, so start with your first woodworking project. If you face any difficulty while using the tool, then you can contact us on our website. Also, don’t forget to share your feedback as we would love to hear from you. Thank you. 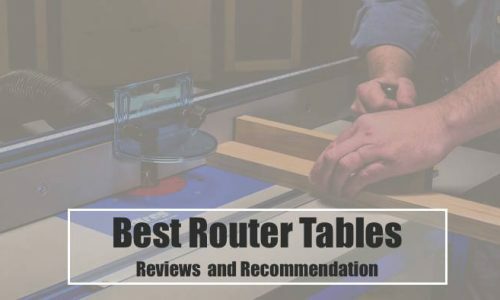 Best Router Table Reviews 2019 – Do NOT Buy Before Reading This! Top 10 Router Tips and Tricks You Should Know Right Now!